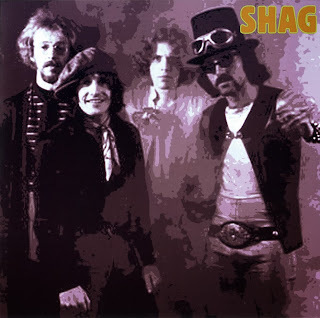 First based in Milwaukee band, The Shag released, over the 60’s two punk/garage singles (the first one under the name The Shags), which are to be found on various compilations. In 1969 the final version of the group, which now had moved to California also have recorded a full album of material at “PHR” at the open hours when Grateful Dead were not recording and creating their “Working Man’s Dead”. Although the recordings were promising they never got a record deal with it and they remained unknown and unreleased until now. Here the group plays hard, mostly bluesy, psychedelic rock with great fuzz guitars and a good rhythm section, as perfect music for night club performances, not only suitable to get drunk on beer to. “Gypsies on the Forest” is my favourite track, -a classic if you ask me, a bit reminiscent of Rufus Zuphall-, which is very rhythmic-melodic and has great rocking flute. “Mad Matter” has a great late night fuzz jam rock drive, and some mad laughter on the background. “Riddle” is a harder rock song, while “Anyone’s Song” is an ok common ’baby' rock song. “Cold Duck Wino” continues this way slightly more calmy rocking, with fine fuzz solos. "Lavender Tab, Ooh dilly dilly" is like the first track, has again a partial rhythmical-melodic partly song drive, while "Lovely Lady" rhythmically is a calmer rock song with some more fuzz.